Off to a gloomy start. We don’t take our traditions lightly when it comes to bike rides and New Idria is no exception. We had done the same route since 2003, but it was time for a change. Clear Creek Road has become a rutted spoor, not worthy of being ridden on a road bike. We found two alternative roads. More on that later. Our ride got underway at 8:20 a.m. from Paicines on Hwy 25, called the Airline Highway because it’s so straight and flat that a Boeing 707 could make an emergency landing here, or so it would seem. We finally recruited a new rider to join us, Matthew Forrester, who rides a steel frame with 25mm Continental tires. John Woodfill and Brian Cox completed our four-rider team. As a side note, to do this ride you need to sign up on a BLM website and carry your permit. There’s a $6 processing fee, which does not go into BLM coffers, but some company that manages the website. Get the Serpentine ACEC permit on Recreation.gov. As we rolled along there wasn’t much to see through the dense valley ground fog, temperature a cool 51 degrees. However, we heard the song of red-winged black birds alongside the marshy areas next to the road. The fog burned off after about an hour to be replaced by warm sunshine and calm air. When we arrived at Willow Creek Road where Willow Creek crosses Hwy 25 we briefly entertained the thought of taking this route, but that would involve hopping fences, encountering bovine, angry dogs and crossing San Benito River, which we already had to look forward to on Old Hernandez Road. 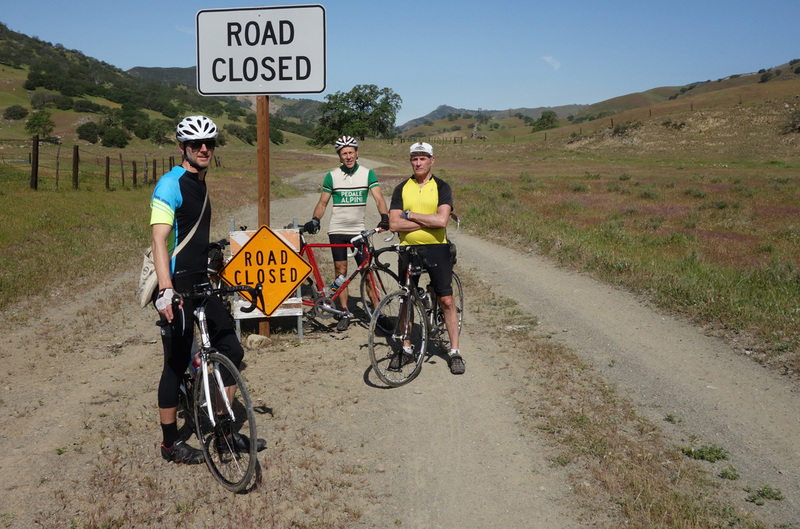 The ride through the San Andreas Rift Zone passes scattered vineyards on a winding road that speaks to why so many people enjoy living in the Bay Area. 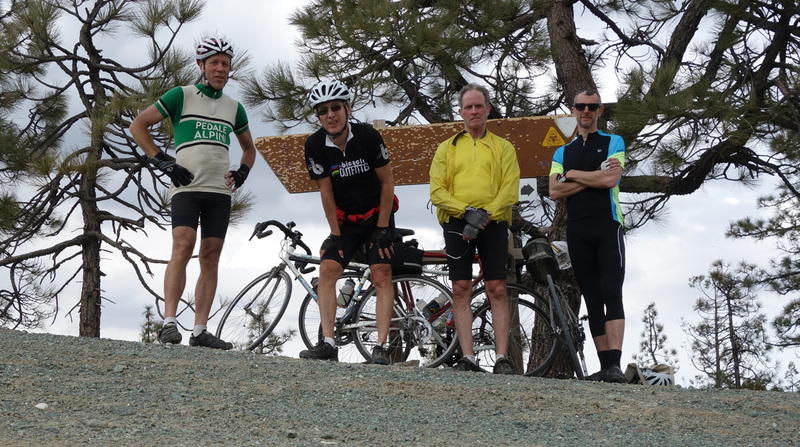 After passing the Pinnacles National Park entrance we began a climb of 8 percent and noticed at the summit a brief road closure due to a rock slide. It was easy enough to walk through the slide, but I rode around. 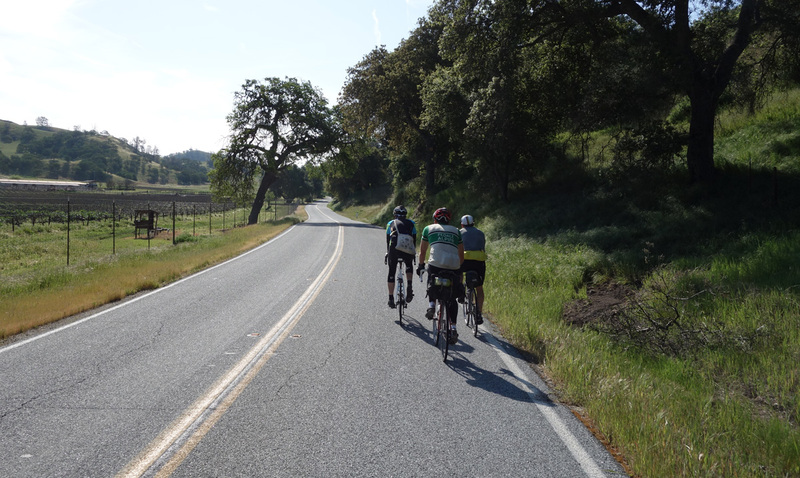 We turned left onto Old Hernandez Road 21 miles into the ride to be greeted by rocky cliffs glowing brown in the morning sun, overlooking the San Benito River valley. We passed the Jefferson Elementary School in this remote setting and continued south, passing the first sign indicating the road was closed 5.5 miles ahead. Ready to cross San Benito River, but where? The road hugs the hillside overlooking the lush river valley where ranchers raise cattle and horses. It’s an idyllic setting and one enjoyed from the saddle as we rolled along the mostly flat road. Brian suggested we take this route in 2005. The road ends at Smoker Canyon Creek where there’s a ranch house and barn with a threatening sign that this is private property and the road is closed. After about a half-mile on a flat alluvial plain we reached the mighty San Benito River, which never fails to surprise us with its depth and ease or difficulty of crossing. This year, unlike years past, the river had a thick layer of mud both sides of the shore. I proudly removed my slippers from bike bag and took off my shoes, not wanting to get them wet. The others ventured upriver a short distance and crossed. However, I charged directly into the river and immediately got stuck. My feet sank a foot into the muck and when I tried to remove my foot, a slipper came off. I spent minutes extricating myself before fording the river upstream. Washing of the feet in San Benito River. We washed off our feet and remounted for the ride ahead, an undulating dirt road that goes for four miles before reaching pavement. In this secluded valley we came across cattle outside their fence. When they saw us they began trundling ahead of us, uncertain what to do. Eventually they headed off to the left and took refuge in the shade of an oak tree, realizing that there was a cattle guard just ahead. Without a car to be seen, this road gives a nice break from the routine of traffic on Hwy 25, as well as a flatter route to Coalinga Road. 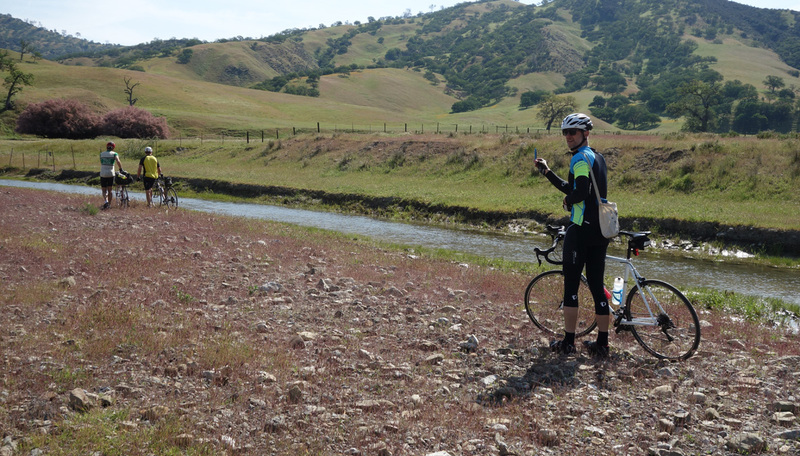 We headed left onto Coalinga Road following the San Benito River, a section that looks a lot like the backside of Mt. Hamilton. At this point you can’t help but notice the wildflowers: California Goldfields, purple Owl’s Clover, Blue Lupine, California Poppies. These flower displays kept us entertained until the steep climb through Lorenzo Vasquez Canyon. At the summit there’s Sweetwater Spring, 2900 feet, where we have on occasion taken a drink to get our dose of arsenic. It’s a quick descent followed by a short climb and another descent to arrive at Hernandez Reservoir and Valley, which may or may not have water depending on the amount of rainfall. This year there has seen rain (9 inches in Panoche). We crossed San Benito River for the last time on a concrete spillway. The ride complexion changes dramatically with a long ascent following Clear Creek on a dirt road. Four off-road motorbikes passed us coming down the hill. ORV and motorcycle users took issue with the BLM closing the road in 2008, but to date it is still closed. That may change if the Clear Creek Recreation and Conservation Act is passed by Congress. Traditional photo at the summit. We continued uphill on the road, which crosses Clear Creek 10 times on concrete pads. Each time I crossed, I accumulated dirt in my front fork/brake area, forcing stops to dislodge the mud from my Ritchey Break Away. About three miles up the narrow canyon we came to a locked green gate that prevents motorists from continuing on to New Idria without a permit. BLM provides a combination after registering. Mostly rock hounds use the permit process; this area is rich in minerals. Mine tailings can be seen everywhere. The temperature had been climbing in the canyon until halfway up when clouds moved in and cooled things down nicely. Wind had not been much of a factor and would not cause us difficulty until Panoche Road. The real climbing begins at a signed junction where we turned left and began a 2.7-mile grind to the summit at 4,450 feet. It’s about a 10 percent grade and the road is covered with loose rock and sand, making going tough if you’re someone who doesn’t have a lot of leg power. However, stronger riders will make it up the road with relative ease. At the summit we took the obligatory group photo and then decided on breaking tradition. We had always gone down Clear Creek Road, but over the years it has become deeply rutted. We agreed to take an alternate route that passes Aurora Mine to the south 0.4 miles on a flat stretch of dirt road. It was a wise decision. Fabulous descent on the Aurora Mine route. 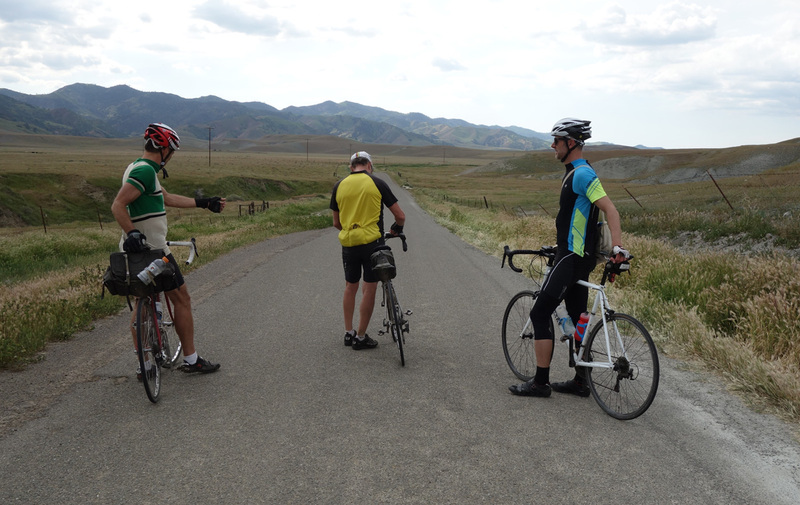 The road condition was such that descending proved straightforward, even for road bikes as the road snaked its way down an exposed ridge with spectacular views of Panoche Valley in the distance. The route adds a few tenths of a mile to the the ride, but it was well worth it. We reached the New Idria holding pond with its distinctive blue-green water that holds a plentiful supply of toxic water. Back on Clear Creek Road we ran into many places where the ORV users had churned up the road when muddy, turning it into an obstacle course with watery mud holes. I ventured to ride around one of those holes, but found myself descending into the water hole and bouncing out, my bike covered in mud. Mine entrance on lower Clear Creek Road a mile from New Idria. We descended steeply for a mile on the rutted road before reaching another junction where we broke tradition again. I noticed a road to the north that followed a ridge and then plunged down to New Idria. I let the others take that route, while I took the traditional route past the mine entrance. There’s one section that requires walking before the mine, but is otherwise rideable. The other riders reached New Idria only seconds before me and said the road is vastly better than the traditional route. In New Idria there’s slow progress to dismantle the smelting plant and clean up this Superfund site. It’s hard to believe that this was at one time a thriving community with around-the-clock mining operations to extract cinnabar and other ores. The mine closed in 1972 after 118 years of use. It was already 3:30 p.m. so I realized that I’d be riding in the dark once again. The ride complexion changes dramatically leaving New Idria. The road descends steeply on mostly dirt for a mile before finally bottoming out. From here there’s a nice descent through Vallecitos Valley where you’re greeted by wide-open spaces occupied by cattle, windmills and grassy plains. New Idria road climbs gradually and then descends gradually into Griswold Canyon. Along the way we found ourselves riding on the dirt shoulder, much smoother compared to the pavement, patched time and again. John saw some tri-colored blackbirds among the red-wing variety, a much less common bird. Griswold Canyon, cut by the same named creek, gives riders a chance to pick up the pace, especially so since we had a nice tailwind that blew us into Panoche Valley for the run to Panoche Road. A left turn here put us into the teeth of a headwind that blew constantly until we reached Panoche Inn five miles later. This is the only store, so we stopped for an ice cream cone, the store’s specialty. Owner Larry and his wife lovingly care for the store, living out back. New Idria Road open spaces. John enjoyed talking with Larry about their chance encounter in downtown Palo Alto last year, his wife visiting Menlo Atherton high school for the class of 1965 reunion. It’s a small world. Speaking of a small world, we were passed several times by a man and his wife on an off-road motorcycle. They took a different route from us, but we kept running into one another. Things got really weird when we saw them once again in the same Hollister taqueria later that evening! We exchanged stories about our adventure rides. But I digress. We still had 27 miles to ride and it was already after 6 p.m. Fortunately I brought my trusty EagleTac LED light. The headwind continued for the next hour and a half, but once climbing it was no longer a factor. John stayed behind to ride with me while Matthew and Brian went ahead, anxious to reach Paicines before dark. Neither had a light. They almost made it, arriving at 7:50 p.m.
We crested Panoche Pass at 2,100 feet and from then on the climbs were brief and easy. 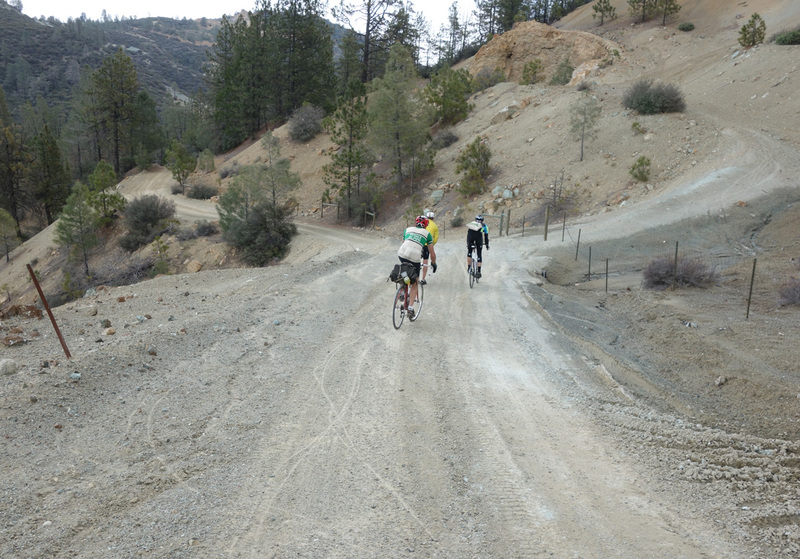 It was mostly downhill following Tres Pinos Creek through a canyon and then into a valley. This time of day is my favorite. The setting sun brings out vivid colors and puts valley oaks in stark contrast to green meadows populated by wildflowers, a riot of yellow, blue and purple. We especially enjoyed the deep blue Larkspur covering the hillsides. With temperatures dropping into the low 60s, it was ideal weather for riding at a brisk pace. By 7:40 p.m. it was time for the light, which is every bit as powerful as a car’s headlight. We could see potholes during long descents. Another benefit of night riding is that it seems like you’re going faster than you really are. 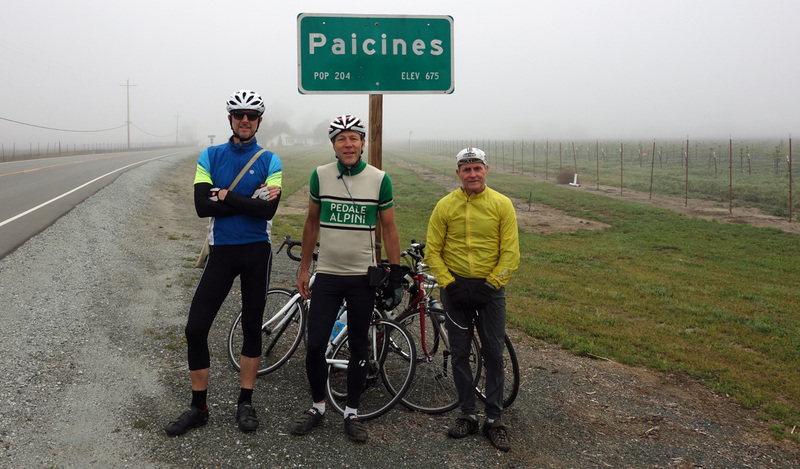 In pitch darkness we arrived at Paicines, 8:20 p.m. and 114.5 miles on our cyclometers. It’s good to see that others are taking up the quest, including Stefan Eberle and his Dutch friend. 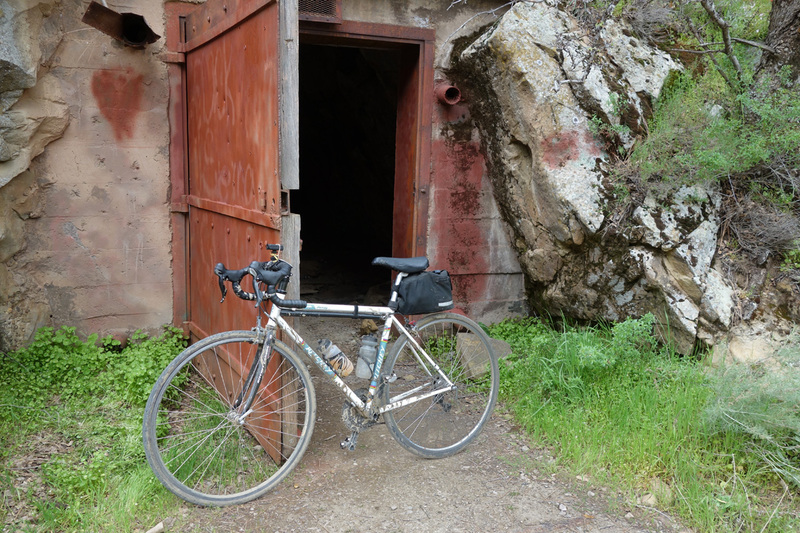 We have Bruce Hildenbrand to thank for pioneering the route, one of the best adventure rides you could ever ask for in the wilds of San Benito County. 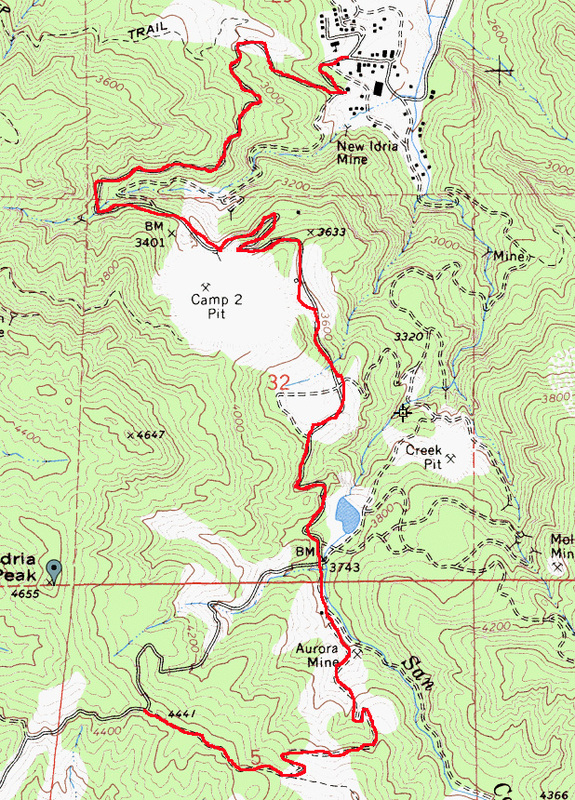 Recommended route to New Idria from summit. This entry was posted on April 4, 2016 at 1:41 pm and is filed under Ride reports. You can follow any responses to this entry through the RSS 2.0 feed. You can leave a response, or trackback from your own site. Riding through is legal. We saw the owner and he said nothing. They just don’t want yahoos trying to drive through and getting stuck in the river. Well done Ray! Thoroughly enjoy reading your adventures. Your writing is so descriptive it’s like being there. Truly inspiring! Sounds like you had a fun ride. How were the flowers in comparison with previous years? And the fords? Not unpleasant to end in the dark – but a long day! Flowers were much better this year than last, but not as many poppies as in years past. Clear Creek fords the same as always. This is an epic ride. I started and finished from Pinnacles NP, 120 miles. I had such a vicious headwind from Idria to Paicines (so about 50 miles) that I almost cried at times. I don’t get it how you could it on 25mm tires. I was on 40mm happy mediums and was so glad! 28mm tires. I’ve never had much headwind, although some, 10-15 mph or less. Great ride.